Need a gluten-free, non-flour pancake breakfast? Who doesn't, right? Well, this delicious flapjack recipe is so good you'll want to make seconds. Or thirds. Or ... forget it, just make these cakes. Slice apple and sprinkle with 1/2 tsp. of cinnamon and 2 tbsp. Splenda. Place on baking tray and bake for 4-5 minutes, or until tender. Meanwhile, combine cooked rice, milk, rice flour, protein powder, 1/8 cup Splenda, applesauce, baking powder, oil, and 1/2 tsp. cinnamon in a bowl. Heat a large, non-stick skillet over medium heat. Pour batter onto skillet in small circles. Flip after 2-3 minutes or when edges begin to turn golden. 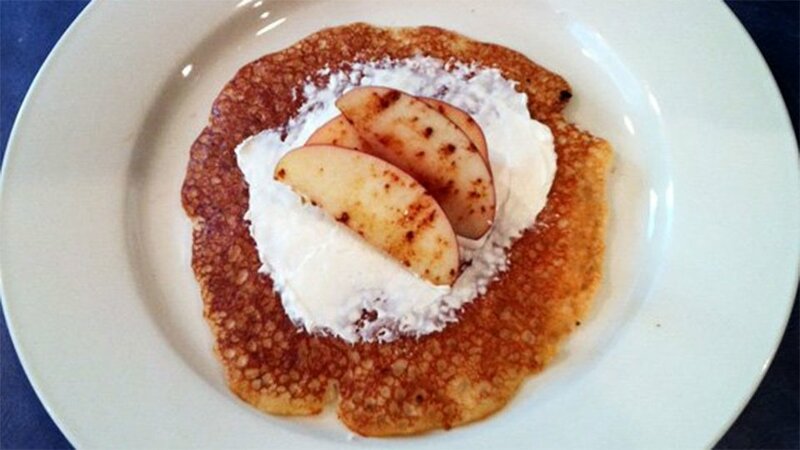 Once pancakes are done, smear with fat-free cream cheese and top with cooked sliced apples. Serve immediately.